Aris Apollonatos spreads the good word of fusion. 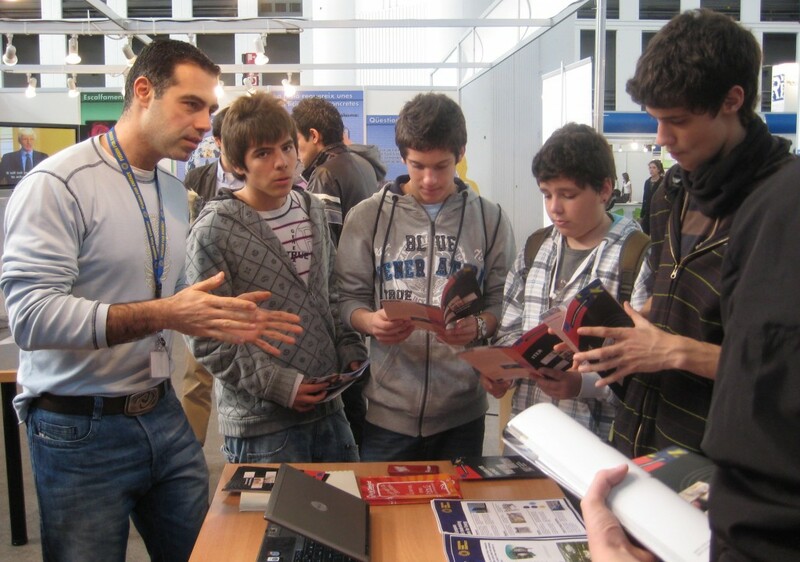 The 2009 Education Exhibition of Catalonia, Spain, opened its doors 18-22 March to welcome more than 80,000 students at the crossroads of some serious decision making: which degree? Which university? what career? The annual event brings together universities, vocational training schools, occupational training centres, language schools and baccalaureate programs. This year's feature was the creation of a new science/technology area in order to stimulate the interest of young people and promote scientific careers. The European Domestic Agency "Fusion For Energy" was asked by the Fundació Catalana per a la Recerca i la Innovació (FCRI) to participate in the science and technology area in order to explain the basics about fusion energy, the objectives of the ITER Project and the types of career linked to this project. We deployed troops from the technical, human resources and communication departments to respond to the different types of questions raised by our young citizens, which defied all standard clichés. We were confronted with an opinionated and critical young generation that expressed its hopes and fears about the energy crisis, the need for sustainable solutions and the challenge to bring the energy of the sun to earth. Most students were impressed with the size of the reactor and the small quantity of fusion fuel that we need to generate electricity. Their favourite questions were about plasma temperatures, magnetic confinement and sustainability. Our favourite question was "When will you join us?"